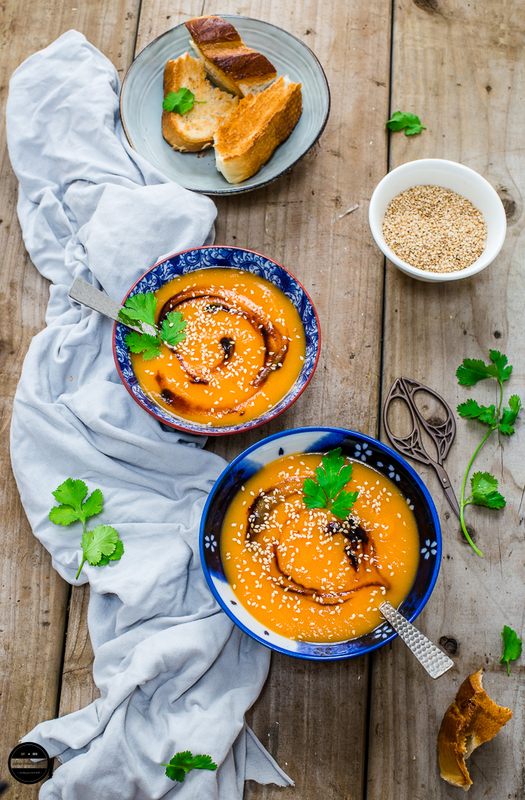 A hearty, comforting and an Asian inspired Spicy Carrot Soup that will warm you up on those freezing days. It is made with a few ingredients such as Carrots, lemongrass, red chilli and soy sauce and topped with crunchy sesame seeds. This winter I broke my own record, I have already posted a good amount of soup recipes which were phenomenal. I just Can't get enough of my Roasted Butternut Squash Soup with Sumac and Tofu Croutons, and also my family favourite Tomato, Harissa, and Orzo Soup, plus the Roasted carrot, chickpea soup with lime and coriander vinaigrette and the fourth one being Roasted Cauliflower, Parsnip and walnut soup. This shows that the weather controls our diets and I am totally fine with it having made all these flavourful soups. After a long time, once again I'm participating in a group'Food Bloggers Recipe Swap' where a bunch of talented and creative food bloggers have come together and all the participants are paired up every other month. They recreate each other's recipe from their blog and post it on their own blog. I absolutely love this idea, it's a learning process and at the same time it's fun to create all those delicious recipes. Guess whom I am paired with? More than a just 'Fellow Food Blogger' Nayna of Simply.food. We do know each other since 2010, she is not only a fellow food blogger but more of a family friend and sometimes I feel she is an elder sister to me :) as I never come home empty handed whenever I meet her. On a neat and systematic blog, she posts simple and delicious recipes that I and my family are lucky enough to actually taste some of them. So while I was searching through her recipes, I spotted Spicy Carrot Soup and straight away I made up my mind, as it was snowing very badly outside, this soup was just ideal. All I wanted was hot, healthy and delicious Soup with crusty bread. I checked the list of ingredients and Bingo! All the required ingredients were lying around in my fridge that morning. Same day around lunchtime I had the soup ready, it did not take me a half an hour to prepare it and we really enjoyed this delicious soup. All flavours were spot on, the different flavours from each and every ingredient were coming through and the toasted sesame seeds added a really nice crunchy texture while the soup was silky smooth. I followed her recipe exactly, but just in the method, I used pressure cooker where she used a special equipment to cook the soup. The flavours and texture of Spicy Carrot Soup, in the form of a satisfying bowl. I used a pressure cooker to make this soup, you can make in a pan too. It may take longer to cook. Change spice level according to your needs. I only added the half the amount of soy sauce while it was cooking, as I wanted to pour over on top of the soup while I photographed. 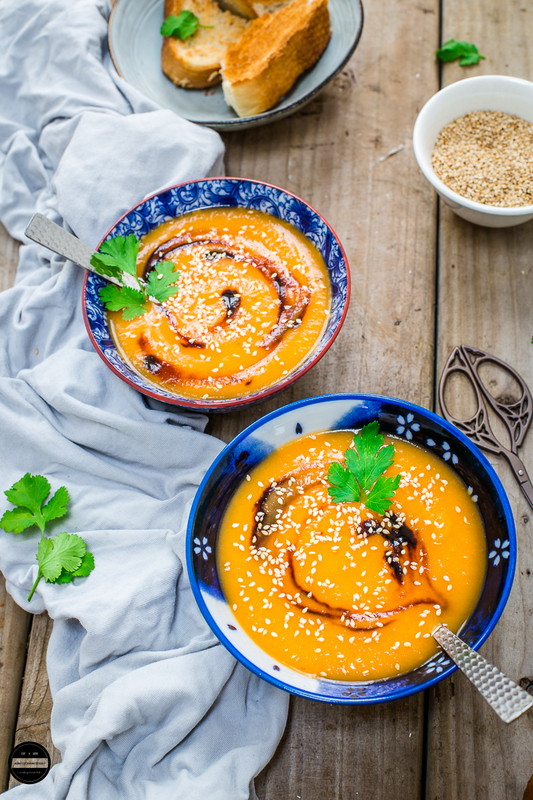 This flavourful and filling Asian Inspired Spicy Carrot soup is so easy to whip up. Place all the ingredients in a pressure cooker or Pan except sesame seeds and coriander.Add around 150-200 ml water and close the pressure cooker lid. ( If you are using a pan, add more water)After 3 whistles, turn off the heat and let the cooker cool off naturally. If you are using a pan, check the water level and cook until its well done.Blend the soup with the hand blender and check the consistency and seasoning. If soup is too thick add about 50mls of boiling water.Pour in a serving bowl and sprinkle sesame seeds on top and garnish it with fresh coriander. Enjoy hot with a crusty bread or rolls. Thankyou for cooking from my blog .I am so glad you enjoyed this carrot soup.Your photos look amazing. Amazing captures dear. Superb recipe. Sounds having all exotic flavours within.. easy and delicious. My kind of soup, would love to enjoy this healthy and hearty soup rite now for my lunch with some grilled bread slices. Inviting.. Healthy bowl of soup.. Love to have soups for lunch. First of all the pics are so good. And this is one recipe that I will be making as I love those Asian flavors in there! Amazing presentation. Lovely share Jagruti. Soup looks so inviting. Delicious and comfort dish for the winter. I would love to try soon. Beautiful colour of the soup. Love the pictures. Making it in the pressure cooker is so quick and easy. I totally love soup, irrespective of the season. You make the simple soup look so royal... beautiful clicks! Hee... My family will never realize what they are drinking. This rains...we are in for a treat. Beautifully presented. Love the colour of inviting soup.. I love having soup any time of the day and this is truly tempting ! Carrot soup looks so tasty and spicy. Love the beautiful presentation and the styling. 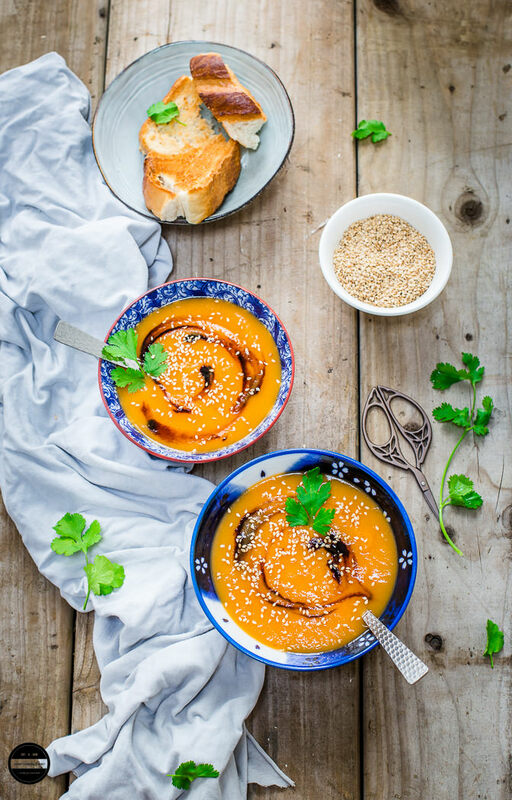 Carrot soup looks so delish, love that bright colour. Gorgeous one. Healthy and comfort soup for all the time.. perfect in colour and texture.. And the toasted sesame seeds is a new variation here..
A hearty and vibrant soup for all seasons!